This beach and surfing town in northern Chile is relaxing, warm, safe, and fun year-round. The hostels listed here are great options for places to stay if you're looking for something affordable and social. 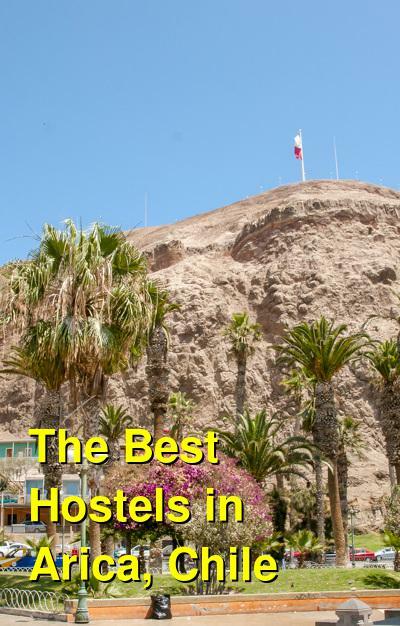 How much do hostels in Arica cost? Hostal Sunny Days is a 5 minutes walk from Chinchorro beach and only 2 km away from the main square. 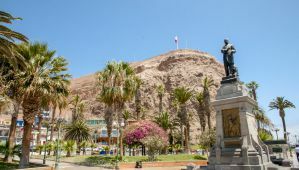 Arica's international and domestic bus station is 800m from the property and the airport is 20 km away. The hostel offers free Wi-Fi, free continental breakfast, a charming garden and rooms with either private or shared bathroom facilities. Providing a tranquil environment, Hostal Sunny Days offer a 24-hour front desk assistance to help you with any need you may have and a currency exchange service. Bicycle rentals can also be arranged upon request and free private parking is possible on site. Free breakfast, free WIFI, a games room with board games and a foosball, luggage storage, safe deposit boxes, laundry facilities, cable TV, hair dryers, a common room and an outdoor terrace are all available at Hostal Sunny Days. Hostelling International Dona Ines is located only 5 minutes away from the city center in taxi or car and there are plenty of shared taxis (every ten minutes) headed to town. Every private room and dorms include a mini-refrigerator, cable TV, private bathrooms with hot water 24 hours a day and daily room cleaning service. A free breakfast buffet is available until 12:00 and check-in/check-out times are flexible. There are shared kitchen facilities, a bar, a cozy and colorful patio with hammocks, a foosball, a pool table and a friendly and single staff to take care of you and provide you with any information about Arica. The hostel also features a currency exchange service, free parking, a book exchange, an outdoor terrace with a BBQ, security lockers, a steam room, laundry facilities, luggage storage, bicycle hire, 24 hour reception and security, a tours & travel desk, towels for hire and Free WiFi. Arica Surf House Hostel is a quiet, comfortable and safe place in the downtown of Arica, near the famous surf spot. The hostel provides all the necessary facilities to make your stay at Arica Surf House more enjoyable, including free WIFI, hot water 24 hours, a shared kitchen, private & shared rooms as well as private & shared bathrooms, free breakfast, bed linen and towels included, a cable TV room, a book exchange, full-day tours, bike rentals, surf lessons and rentals and airport transfers at an extra cost. The staff is friendly and helpful and can answer any travel related questions you might have. If you want to stay next to the beach, out of town, at very fair prices, this is the place! The hotel is right by the sea and about 3 km out of the city to the north. There is no bus service nearby but the owner offers free pick up and delivery to the bus station and a taxi costs about USD$6. You can also decide to walk to the market and the bus station in 1 hour and 15 minutes, which is actually a nice walk on a good pavement along the road and the beach. The rooms are very big, the wifi is excellent and the bathrooms are also very large. Some rooms face the ocean and have small terrasses and all rooms are provided with a small refrigerator and solid, high quality furniture including a large table, chairs, a wardrobe. Great for relaxing! Breakfast is excellent and the restaurant next door is perfect for a delicious evening meal. The owner can also cook dinner for you at fair prices. The hostel includes free WIFI, self-catering facilities, free breakfast, cable TV, a book exchange, bike rentals, a washing machine, hair dryers and an outdoor terrace.